When deciding where to move, what should take priority? The proximity to shops, or good transport links, or the availability of good schools, if you have children? Of course, all of those things are important. But what about the proximity to green spaces? After all, most of us, regardless of where we choose to live for practical reasons, like to have some access to the outdoors some of the time. Some of us love going for a run in the morning, while others simply enjoying being around trees, or perhaps even bird-watching. In fact, what with scientific research proving that green spaces are good for us, having access to nature in an urban area is not just a nice to have, but a very important part of life. So, we've rounded up the UK's greenest cities – and we think you'll be surprised – plus there's a little extra know-how thrown in for anyone thinking of moving to London (but dreading the urban sprawl). 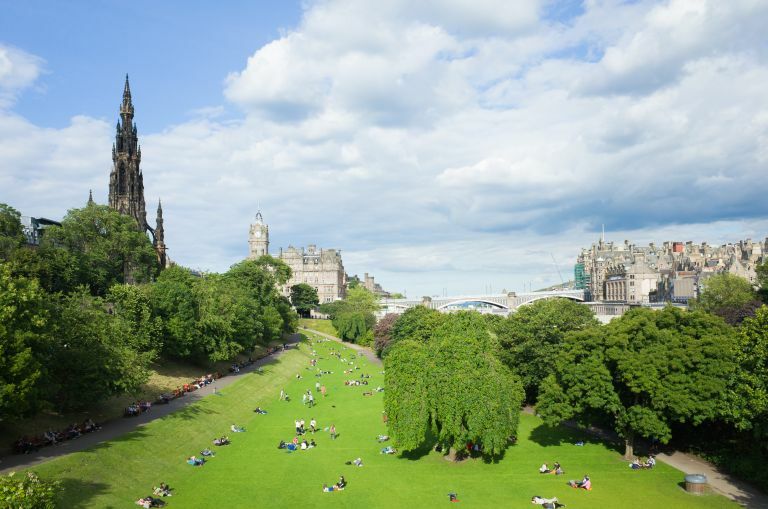 As if there wasn't enough to recommend this gorgeous city – beautiful architecture, the famous Edinburgh Festival, and the terrific music and comedy scene – Edinburgh is the greenest city in the UK, with 49.2 per cent of it consisting of green spaces. From the centrally located Princes Street Gardens, right in front of Edinburgh Castle, to the hike-worthy Holyrood Park, the city has an impressive 20 parks. Our favourite is the slightly wilder-feeling Meadows in the south of Edinburgh – perfect for a run or a family picnic. Beautiful Glasgow Is Edinburgh's busier, bustling cousin, bursting with galleries, cafes, and cultural events. But did you know that it's also one of the greenest cities in the UK? Featuring a very impressive 90 parks and green spaces, it has much to offer to both lovers of manicured Victorian gardens and those who prefer a quiet woodland walk. Love to take your walk with a dose of local history? Head to the stunning Pollok County Park – only three miles from the city centre, it is large enough to accommodate hours of cycling or hiking (there is even a heritage hiking trail); there is also the impressive Pollok House with its manicured gardens to explore. Want a day out with the kids? Head to Cuningar Loop, which is a spectacularly regenerated 15-hectare woodland that has adventure playgrounds and Scotland's first outdoor bouldering park. It's official: Bristol is the greenest city in England, with 29 per cent of the city consisting of its many parks and gardens. Greville Smyth Park in the city's south is famous for its large trees and a community-led activity programme. And to escape the gloom of a wintry day, head to the spectacular University of Bristol Botanic Gardens, currently housing over 4,500 species of plants, including tropical plants on display in glasshouse pavilions. Birmingham may have less green space than Bristol percentage-wise (24.6 per cent), but it actually has more green spaces than any other European city of an equivalent size. What makes the green spaces of Birmingham especially exciting is their Nature Reserve status. Thus Sutton Park, covering 2,400 acres, contains wetlands and marshlands, seven lakes, and extensive ancient woodland. And Handsworth Park, only a 15-minute bus ride from city centre, has a boating lake perfect for summer afternoon fun. When you think of London, is the first thing that comes to mind a busy train station full of commuters? London may well be one of Europe's busiest cities, but it also is one of the greenest: in fact, London has eight million trees, making it the world's largest urban forest; this has recently been recognised by giving London the status of the world's first National Park City. From the gloriously serene Richmond Park – so big that some prefer criss-crossing it by car – to the woodland expanses of High Barnet, containing a 2,000-year-old tree, London has tons of green space to offer to wildlife lovers, joggers, cyclists, and anyone who loves being outdoors. Thinking of settling in the capital and want to be as close to greenery as possible? These are the areas you should be considering moving to (below). London contains plenty of green spaces, regardless of whether you are eyeing up central areas, or are looking for a comfortable suburb to settle in. Money no object? Move to Highgate, Golders Green, Muswell Hill or Hampstead, all close to Hampstead Heath, Highgate Woods and Alexandra Palace. The Heath, which is walking distance from Camden, feels like a woodland retreat deep in the countryside. Looking for a hidden green gem? Try Stratford. With its hugely successful post-Olympics regeneration programme, it now boasts the gorgeous Queen Elizabeth Park. Not to mention the nearby Victoria Park, which was the first public park in London and retains a welcoming spirit. Consider moving somewhere that isn't quite there yet, but will one day have a lovely green space round the corner? Kidbrooke Village in Greenwich is looking very promising. The whole area is being redeveloped into a new residential district, with the developers paying particular attention to the wasteland that currently surrounds the site, promising to transform it into a park and mini nature reserve.